LANCASTER – As we reported last week, Lancaster Mayor R. Rex Parris financed a hit mailer that claimed City Council candidate Johnathon Ervin was a “gang candidate” who had led an “anti-law enforcement protest.” Read more here. A new political mailer making the rounds this week also takes aim at Ervin, while urging Democratic voters to choose Oscar Mejia and Jordan Campbell for Lancaster City Council. 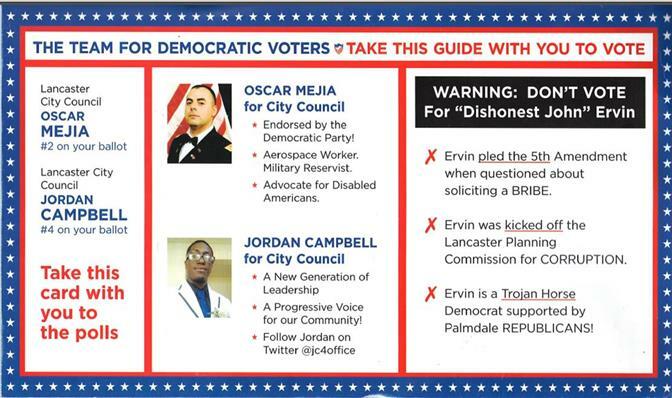 The Democratic-themed mailer warns recipients: “Don’t Vote for for ‘Dishonest John’ Ervin,” and it claims Ervin pled the 5th when questioned about soliciting a bribe; Ervin was kicked off the Lancaster Planning Commission for corruption; and Ervin is a Trojan Horse Democrat supported by Palmdale Republicans. View the mailer here. Both Campbell and Mejia have denounced the mailer and say they had no part in its production. Democratic Voters Choice is owned by marketing and advertising consultant Tom Kaptain, who could not be reached for comment. In an LA Weekly article titled “Slate Mailer Sleaze in L.A.,” Kaptain claimed to “know every councilman in every small town in California,” and said the profit-making mailers were “a way to help my friends…” Read the article here. Another news article in the Bakersfield Californian claimed Democratic Voters Choice faced frequent criticism for sending out mailers that appear to represent Democratic views, but which endorse Republicans. Read that article here. “This is what you call a fraud that’s perpetrated on the voters,” said Eric C. Bauman, Chair of the Los Angeles County Democratic Party. In a phone interview Thursday, Bauman said the Lancaster mailer in question had absolutely nothing to do with the County Democratic Party, which had actually endorsed Johnathon Ervin. Parris did not return repeated calls for comment on whether or not he had financed the Democratic-themed mailer. Lancaster City Council candidate David Paul said Mejia and Campbell should be held accountable, to some degree, for the content of the mailer. The Lancaster election takes place April 8. 27 comments for "Candidates denounce ‘fraud’ mailer"
Oscar Mejia has already publicly stated that he would take the position on the Planning Commission offered by the Mayor. The denunciation sounds just a WEE bit hollow…. I think most people paying attention know that this has the mark of Ron Smith all over it. The goal is to divide the anti-Establishment vote. That’s why they support two minority candidates. Johnathan Ervin is their worst nightmare, and they’ve got to do everything they can to beat down a minority who dares to run for office without prior approval. I hope the City Attorneys of Santa Clarita and Palmdale notice that the Mayor is supporting two middle-aged white guys over minority candidates. Congratulations AV Times for excellent coverage of this election, which to read the other local Press is not even happening. . . hmm. Most of my constituents do not engage in this type of forum. I reach them by going out to meet them in person after they get off work or they get off school or after dinner. At this point I find little value of arguing with you when every other word sounds like you have voted our are voting for one particular candidate and are only out to discredit myself our other candidates through HATE. The results will surprise you on 8 April. Further more you will read into things according to what you already believe. Someone will come along and dissect my message to find statements and words that proof their own political stands. Good for you, I have spent 12 years in the military defending that freedom. At the end of the day when a stranger helps me with my wife’s wheel chair, I know there are good people in the world. Good day to you, and may the residents of Lancaster come out to vote on 8 April. I’ve read your comments, and while still somewhat undecided, would say you have a fairly good chance of winding up as my second selection. Such is the problem with politics now. It’s no longer what good you can do, what your plan is. It is how bad you can make your opponents look while attempting to purvey a clean image. Lose with your morals intact, better than winning with your principles being sold. The only thing that surprises me is that you think you are a viable candidate. This is truly nauseating and vile! I can’t support any leader that uses fear mongering and race baiting in attempt to win an election. Huh? I am the ONLY the candidate to face the city council meeting after meeting for the past 3 1/2 years. I have gotten up between five or six times each meeting after I researched the agenda and spoken with city officials or department heads. Ervin accepted an appointment from Parris. He was fired by Parris. Crist was appointed vice mayor by Parris and he accepted. Smith was the vice mayor and he accepted the appointment from Parris. Ervin, Crist, and Smith are appointees of R. Rex Parris. Also, I am the only candidate that has proven he can stand up the candidate to discuss issues with the council without getting into a fight. If you want same old politics, vote for Ervin, Crist, or Smith. If you want change and someone who has proven his ability, please elect me. As we have all discovered over the last few years, only people that Parris considers an ally or a threat get offered commission positions. You apparently weren’t considered enough of either an ally or a threat to Parris to even be offered a commissionership. Further evidence of this is in how Parris’ machine is pretty much ignoring your candidacy. I am Rex’s worse nightmare because I will be allowed to challenge any agenda item and speak as long as I want to get answers. I recall Ervin speaking once in 3 years. Ervin was fired from the Planning Commission for improperly contacting a developer on a project he was to impartially vote. Don’t you think it would be improper to ask a developer if he would do something before you voted on his project? How dumb can you get. It raises all inferences of corruption. Prediction: if Ervin gets on the council he will mosey up to his former boss and become ‘one of the boys’. Remember Crist and Mann were not part of the team, but they sure are now! Ervin will back on the team, too. Thank you for proving that you are, after all, a Parris shill. Your choice to attempt to reinforce a Parris lie, that has been proven to be a lie by multiple investigations, shows beyond a shadow of a doubt that you do Parris’ bidding. You are done. I will NEVER vote for you now! Ervin admitted himself he contacted the developer to see about something for QH high school. Does that mean that he would have voted for the project if it was quid pro quo? Is that correct for a planning commissioner to do? Not in my book. He should have waited until the developer appeared before the Planning Commission and discussed any mitigations in public. When there was the big discussion at city hall to midnight about the Walmart. I appeared before the city council, developer and the people of QH and proposed a compromise. I wanted a park to separate QH high from Walmart. Of course, it was defeated and the council approved the Walmart. I don’t think I am a pawn of Rex. I haven’t been appointed to anything by Rex like Ervin or promised anything. Anyway, thanks for your comments. I like people who discuss our community and its leaders. Everybody who investigated this (and there were many) found absolutely no wrongdoing in Ervin’s actions. Even the developer who was contacted stated that there was NO quid pro quo even hinted at. Ervin simply researched the project, like any free-thinking commissioner should, including possible alternatives for mitigation on a hotly contested issue. Your continued attempts to paint this the way Parris does with negative attacks on a well established red herring is what shows your TRUE allegiance… And it AIN’T to the people of Lancaster. even lancaster’s city attorney said there was nothing wrong. but that don’t stop rexie from repeating the lie and trying to ruin someone. it is part and parcel with rexie: false accusation, repeat false accusation. I thought this might clarify where I stand on the issue. Mejia, Paul and sadly even Rives are Raymond’s shills brought together for the sole purpose of decimating vote to allow Mayor What’s Yours is Mine, Fearless Former Deputy Chinless and Starvin Marvin to slither back into their political swamp and continue doing what they do best. A bullet vote for Ervin is unfortunately the only answer. “I want people to know, first of all, I didn’t send it and it never met my preapproval,” Mejia said. “ This statement sure sounds like he knew about it but didn’t approve it. Sure sounds fishy to me and now that Rex has offered him a commission seat if he loses makes sense. Like I said… Mejia has been compromised. Bullet vote for Ervin. It’s the only hope for the citizens to begin to reclaim the City of Lancaster from the evil that has engulfed it. Between Coronado babbling his double talking “apology”/”worship” of Parris at the council meeting and this double talk by Mejia, it looks like there are two more Rex Yes Men in Commission positions who only do their master’s bidding. Oscar Mejia has been commenting on most stories on this site as of late. I guess it should be no surprise that he has nothing to say about this article. Another desperate act by a desperate scumbag. Parris just can’t help himself – He’s scared to death that Ervin will get onto the council and gain access to all the dirty little secrets that his cronies have helped him keep covered up. Parris knows that Ervin’s election to the council spells doom for Parris’ ambitions (not to mention staying out of prison). Parris’ problem with Ervin is not his race, even though he will use racism to try to keep Ervin off the council, but that Ervin is not able to be bought. This means that this time, when the DoJ and FBI start asking for information, they might actually get information that Parris doesn’t want them to have through a councilmember that Parris can’t control. Vote Ervin – and ONLY Ervin! Mejia has been compromised. I agree.The real threat is that he will stand up to the rats and find out their dirty little secrets. And the hits just keep on comin’..
Geez this is some sleazy stuff going on. I honestly don’t know who to believe these days. I wonder if the “Democratic Voters Choice” people are legally obligated to release the culprit?